It was a busy day for Premiership champions Newtonmore's manager Paul John MacKintosh, who first saw his side beat Glenurquhart 4-1 in Drumnadrochit. He then made the short trip to Kiltarlity where defeat for leaders Lovat against Kinlochshiel would have put 'More top, although with an extra game played. However, while Shiel took the lead with a penalty, Lovat twice came storming back to retain their two-point cushion with a 4-2 win. A draw between third-placed Kingussie and Kyles at the Dell means further daylight between the top two, both on 100%, and the chasing pack. Inveraray and Lochaber both got their first point with a 2-2 draw at the Winterton. Two each from Fraser MacKintosh and Danny MacRae had Newtonmore 4-0 up on Glenurquhart in an hour before Lewis MacLennan got the home side's consolation. At Kiltarlity, Finlay MacRae scored first for Kinlochshiel, but Lovat immediately sensed the danger of losing their league lead. Kevin Bartlett and Owen Ferguson had them in front within nine minutes. MacRae equalised from open play and Lovat instantly responded again within a minute through Lorne MacKay before Graeme MacMillan wrapped it up. Kingussie, with goals from Savio Genini and Thomas Borthwick, were matched at home to Kyles who had Roddy MacDonald and Dunky Kerr on target. At the Winterton. Ben Delaney and Sean Nicholson had Lochaber 2-0 up but Chris Crawford and Euan McMurdo pulled it back for Inveraray. 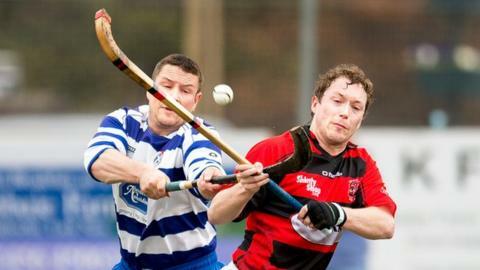 Oban Camanachd remain top of the National Division despite losing 1-0 at home to Kilmallie, with Michael Rodger scoring the only goal of the game. Fort William got their league campaign up and running with a 4-1 victory at Beauly. An Arran MacPhee double backed up by David MacLean and Alexander MacMillan did the trick while Beauly's Jack Fraser reduced the deficit. Caberfeidh made the 400-mile round trip from Strathpeffer to Glasgow to record a 3-2 victory over Mid Argyll. Ali MacLennan for Cabers and Craig Anderson for the home side both got doubles so Ruaridh MacLennan's goal made the difference for Caberfeidh. A series of problems has meant a nightmare start to the season for Bute and a 2-0 home defeat by Glenorchy keeps Bute bottom of the National Division on -2 points after a penalty for failing to raise a team for an earlier game. Kieran MacKay and Grant MacPherson found the net for the Dalmally club. The Aberdein Considine Sutherland Cup, the national reserve championship, got under way with a 2-0 defeat for holders Ballachulish at home to Kinlochshiel. And Strathspey progressed past visitors Strathglass by the odd goal in 11.